As I’ve mentioned before, here, at the start of each month I am taking a verse or two… or three… from Proverbs 31 and working hard that month to implement it into my daily life. Sometimes I find that the best way to make a habit or lifestyle change is to take little bites out of the pie, if you will. 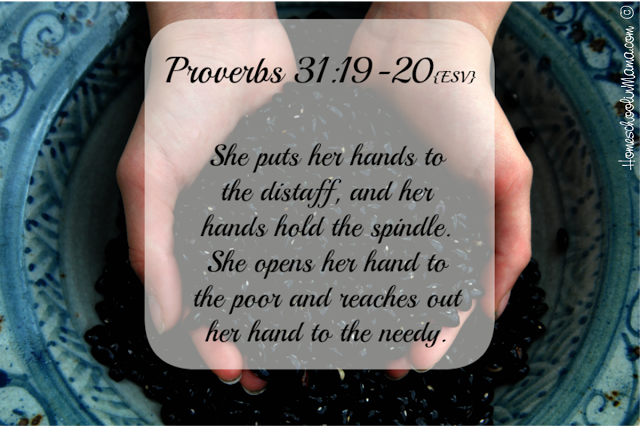 For this month, I am focusing on Proverbs 31:19-20. This verse stands out to me this month for a couple reasons. For one, as winter comes my heart is extra sensitive to the blessings I have. As we’ve had a couple months of cold weather, I am reminded of my ability to turn on the heater of my home and grab a blanket. I am also reminded that not everyone has these blessings. This has always been a tender part of my soul because I know that I often take these things for granted. Secondly, I feel that this verse extends past those who physically have less than us. Generosity comes in many forms. Not only is it extending a helping hand to those physically in need but also spiritually or mentally in need. Weather that is praying for someone struggling or lending a listening ear to a friend, generosity is giving without judgment. I remember a moment so vividly in my mind that exemplified this. I was about 5 years old and we were packing up for a family vacation to Cancun. It was about noon the day before our early morning flight. A neighbor’s (I say this lightly as they lived a couple streets over from us) house went up in flames as the husband was outside and the wife was napping in their room. The wife made it outside okay but practically no part of their house was saved in the end. My papa drove down to help and about 30 minutes later came home to talk to my mom. Long story short, my mom and papa offered this husband and wife our home while we were gone for 10 days so they could be near their house and not need to worry about a hotel or anything. I remember being so confused because we didn’t even know these people! At some point in your life you will be in need. No matter what shape or form that need is in, we all have “that moment” when we are on the other end of giving. Oppositely, at some point in your life (and probably more than one point) you will be the one in the position to give of yourself. She told me to jump at those opportunities because what goes around comes around. This is what they were doing that day. Giving of themselves because they were the ones able to give. I saw this situation come full circle about a year and a half ago as my mom was diagnosed with terminal cancer. She was the one in need. I was so blessed to see the many people step in to give of themselves for her during that time. Around the time she was first diagnosed I remember having the conversation with her that I would be here for whatever she needs and I was uncomfortable asking others for help. She gently told me that it was okay to ask for help. She had always been the one to help others and now it was her turn. She reminded me that allowing others to help in a time of need blesses their lives richly. So, over her 7-month fight, we did just that… asked for help. I was so blessed and I know some of her amazing friends were so blessed by this outpouring of loveand grace. It was truly amazing to see almost 20 years later my mama’s sweet life lesson come full circle. All this to say, this is the verse my heart is consuming this month: reaching out and helping others. I have a strong feeling that at the end of the month I’ll be reporting that I was the one whose life was most blessed. I may not be offering my home to anyone anytime soon, but I can think of a few other ways to start implementing this habit into my spirit. It’s so refreshing to have these verses as my reminder that the closer I draw to the heart of God the better I am as a wife, friend, and human in general. Plus, no doubt at some point this month, God will remind me that I need Him more than ever, and this goal will be much more attainable as I dig deeper into His character and His heart. I serve a mighty God.